Very comfortable place to stay. Great location with access to restaurants and so much more, yet very quiet neighborhood. Loved everything about the apartment. The apartment was clean and comfortable and extremely well equipped. 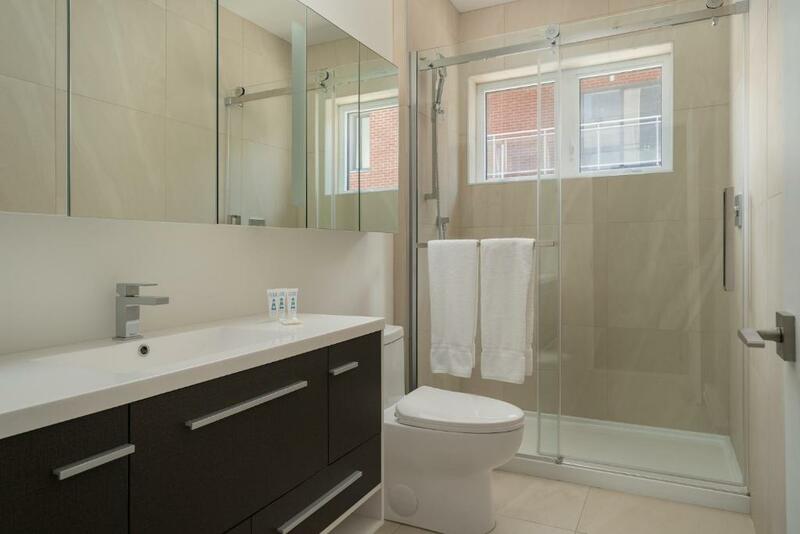 It is in an excellent location being walking distance to 2 metro stations, Chinatown and the start of downtown. The building was quiet. Check-in process was smooth. Perfect amount of natural light. An ideal place for a couple to stay. The kitchen was well equipped and everything was easy to find. The record player was a sweet touch - I was happy to find Lana Del Rey’s debut album as part of the vinyl collection available. Superb studio right in the heart of everything. Just a street away from the city, but still quiet when need be. Literally perfect location & value for money! The location was good and I liked the fact that the space was new. great location with much of Montreal within walking distance, and a lot of restaurants all around. The apartment was clean and appliances were easy to use, and the staff was really helpful. Everything was excellent other than the size of the bed. As the bed is too small for couples. Also, furnitures were dusty. It could have been cleaner. Other than these, it was an excellent place! Thanks for the service! Lock in a great price for Airy Quartier des Spectacles Suites by Sonder - rated 9 by recent guests. One of our bestsellers in Montréal! 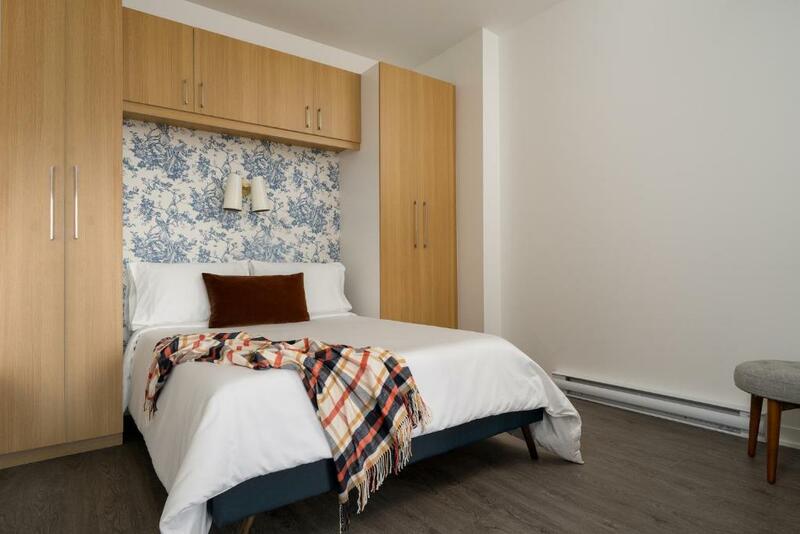 Set within 450 yards of University of Quebec in Montreal UQAM in Montréal, Airy Quartier des Spectacles Suites by Sonder features accommodation with free WiFi and flat-screen TV. Every unit is equipped with air-conditioned rooms and a kitchen with a dishwasher and coffee machine. There is a seating and a dining area in all units. Museum of Contemporary Art is 0.7 miles from the aparthotel. The nearest airport is Montreal-Pierre Elliott Trudeau International Airport, 12.4 miles from the property. This is our guests' favourite part of Montréal, according to independent reviews. 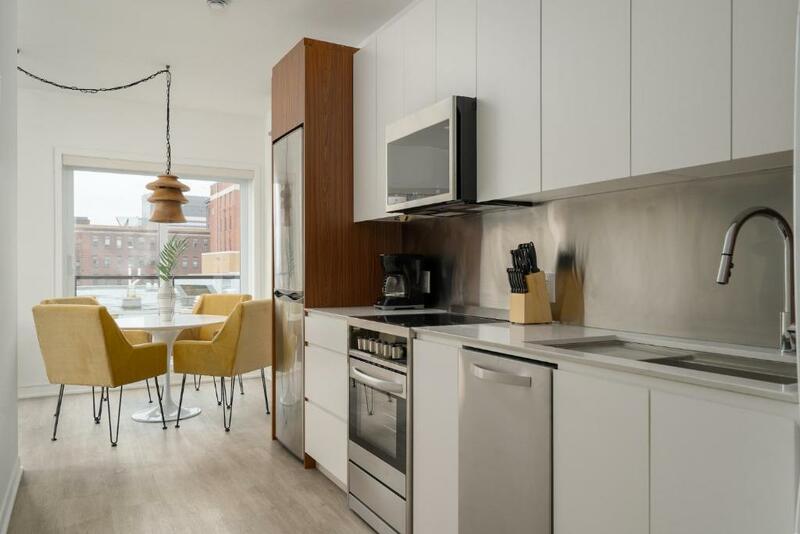 This property also has one of the best-rated locations in Montréal! Guests are happier about it compared to other properties in the area. This property is also rated for the best value in Montréal! Guests are getting more for their money when compared to other properties in this city. Airy Quartier des Spectacles Suites by Sonder has been welcoming Booking.com guests since 24 May 2018. When would you like to stay at Airy Quartier des Spectacles Suites by Sonder? This suite has a washing machine, sofa and microwave. This suite features a dishwasher, oven and tea/coffee maker. This suite has a stovetop, toaster and washing machine. This suite features air conditioning, stovetop and dishwasher. This suite features air conditioning, dining area and oven. At Airy Quartier des Spectacles Suites by Sonder, you'll love the bright and inviting living spaces, chic decor, incredible expansive windows, and beautiful fully-equipped kitchens with modern appliances. Located in the Quartier des Spectacles, known for the renowned Contemporary Art museum - Place-des-Arts, you're close to an array of wonderful local shops and restaurants. 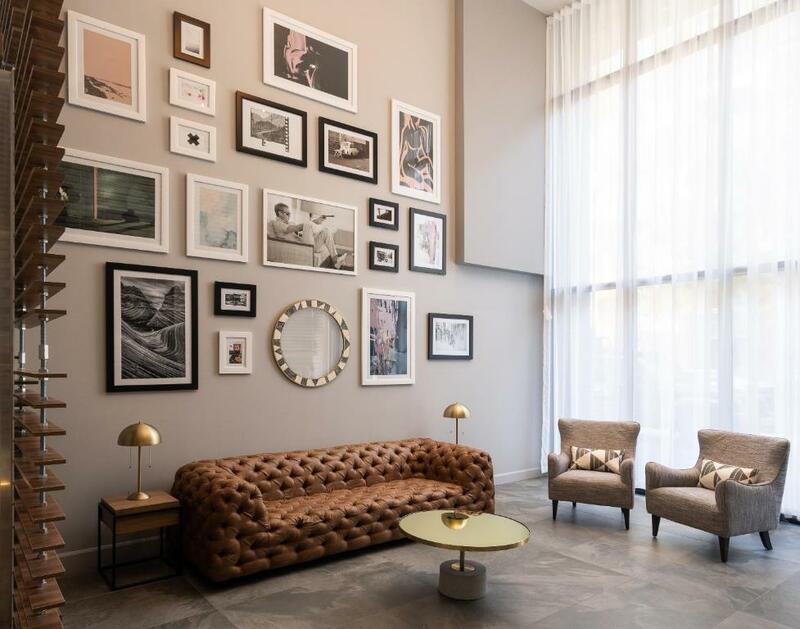 Sonder provides everything you need for an exceptional stay. Every booking is instantly confirmed. Every call or text is answered within minutes. Every home is equipped with crisp linens, high-speed Wi-Fi, and kitchen and bath essentials. And every experience is one-of-a-kind, thanks to our unique spaces and Neighborhood Guides. There's plenty to offer within walking distance. Try Bouillon Bilk or Restaurant Boustan for some of Montreal's best dining. For shopping, head to Rue St. Catherine and take a stroll along the storefronts. To explore the rest of the city, head to the Saint Laurent metro station. Quartier des Spectacles was designed as a center for Montreal's cultural events and festivals, with world-class entertainment taking place year-round in Place des Arts. The area is a great starting point to explore the city. It’s within walking distance of Chinatown, the Old Port, the Plateau, Downtown, the Village, and metro lines. 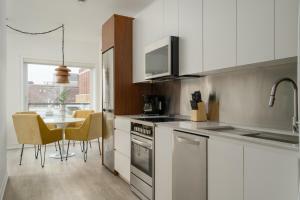 House rules Airy Quartier des Spectacles Suites by Sonder takes special requests - add in the next step! Airy Quartier des Spectacles Suites by Sonder accepts these cards and reserves the right to temporarily hold an amount prior to arrival. After confirmation, Sonder will reach out to guests through a secure link to gather some information regarding the guests stay. Sonder may require the guest to provide a photo of their government issued photo ID. Guests will receive checkin details from property management 3 days prior to arrival. This Sonder unit comes with an HDMI cord so that guests can connect their laptop to the TV and log in to their personal streaming accounts. Please note, cable is not available. Please inform Airy Quartier des Spectacles Suites by Sonder in advance of your expected arrival time. You can use the Special Requests box when booking, or contact the property directly with the contact details provided in your confirmation. Please note that the check-in and key-collection take place at: 125 Charlotte Street, Montreal, QC, Canada, H2X1M2 Montréal. Lack of hooks in the bathroom, and that is all. This place was perfect! The apartment was very modern and comfortable. The facilities offered were very convenient. The location was very central and the neighborhood was quiet. I’d definitely recommend it 100%!!! The main entrance door code expired before my check out. Went out by 10:20am to have a smoke before making a last round and door was locked. Difficulty with door access code and had to wait an hour for someone to come. The duvet is very warm ! Sometimes there is sewer smell in the room coming from kitchen vent on the ceiling, overall it’s ok. I thought the living room as per shown is part of apartment, but it turned out to be a shared place.